What if London's 7/7 bombings were the greatest criminal deception of our time? Are the bombings the perfect ploy to mask a different plot entirely? Is Jake's absent Security Service girlfriend really who she claims to be? 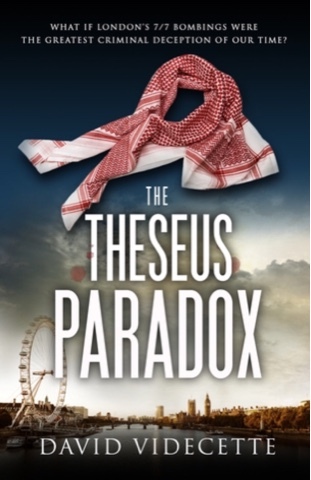 This book follows Jake Flanagan, who investigates the tragic events of 7/7. Trying to find the reason why and who else was involved in the bombing. Jake works a lot on hunches which is not very welcome within the police, not only that but he sometimes bends the rules some too. We follow a huge investigation, with many different people working on the case, from many angles. But the book is mainly following Jake. It's incredibly detailed but never boring. Jake travels between London and West Yorkshire to follow different leads. Interviews many people, visits crime scenes, looks through cctvs and much more. He lives and breathes his work. So much so that his marriage suffered. We get some glimpses of his life beyond work too, the drinking and partying after a long and hard day at work, esp when his girlfriend is as busy and unavailable as he is. I don't really want to give much more away because the developments are what makes it an incredible book. The many directions one investigation can take you. And wow I don't even know where to begin to tell you what I thought of this book. I had to remind myself that this was fiction, this seems so real and not only because it is based around this horrific and tragic real event. It's so well researched and the writer knows exactly what he is talking about that I almost feel like I have been following a very real investigation. Not once did I feel like I didn't understand something either, the way things have been explained throughout the book makes it understandable to anyone, no matter how little you know about police, investigations or terrorism. Right now I feel like I know exactly what happens at a crime scene and how the police deals with evidence. Further more the characters are so real, there is no super cop that all you can do is admire, no, the main character has his own demons in his personal life. I can relate with that so much more. The way his job affects his private life is how I imagine many struggle too. Every chapter was filled with another movement in the story, it never fell flat or gave the impression that this could be left out. Finishing one chapter left me wanting to start another. What would be uncovered next? Are they seeing the bigger picture or are they to distracted by small details? The fact this book felt so very real had me thinking about it at the most random times, I'd be sat at work genuinely worrying about its contense/characters. Like our/my life honesty dependent on what Jake will find. That is an amazing gift, when the fiction don't just take you somewhere for a few hours, but you take it with you wherever you go too. I can't stop talking about this book and am forever gutted that my husband isn't a reader, he would love this too. It's a delicate topic esp currently with all that is going on in this world. It opens your eyes and gets your brain going. You won't always agree with the characters views, and that's when you have to remind yourself that this is fiction but other then that I think, great job with this topic. Nobody is more surprised then me about how much I enjoyed this book. This isn't my usual genre at all. I can't remember when I have ever read anything even remotely similar. But I am so endlessly grateful for this copy that the author provided for me in exchange for an honest opinion. Blogging has opened my eyes to so many new things, this is one gem I wouldn't have found if I didn't have this blog. David Videcette is incredibly talented and I think we will see much more from him in the future. I am excited already!